Butch Hartman | Drawing YOU Live! Watch The Fairly OddParents, Danny Phantom, T.U.F.F Puppy and the brand-new Bunsen is a Beast on Nickelodeon and Nicktoons! More #Hartfans: YouTubers in the Fairly OddParents Style 2 (PewDiePie, Jacksepticeye, Markiplier) | Butch Hartman! Follow NickALive! on Twitter, Tumblr, Google+, via RSS, on Instagram, and/or Facebook for the latest Nickelodeon and Bunsen is a Beast! News and Highlights! More Nick: Nickelodeon Italy To Premiere "Nicky, Ricky, Dicky & Dawn" Season Three On Monday 10th April 2017! Follow NickALive! on Twitter, Tumblr, Google+, via RSS, on Instagram, and/or Facebook for the latest Nickelodeon Italy and Rank the Prank News and Highlights! April Foolzweick is here! Can Carlos prank HER this year? Are mayonnaise donuts a thing in Eastern Prankovia? Could a mayonnaise donut be played as an instrument? More Nick: Nickelodeon UK To Premiere New Movie "Bruno & Boots: Go Jump In The Pool!" On Friday 21st April 2017! More Nick: VLOG KCA 2017 - Dia 1 - Perdemos o voo! E agora? | Nickelodeon Portugal! Clip from Hey Arnold! episode "April Fool's Day". More Nick: April Fools Day on The Splat! More The Splat: Renford Rejects | Theme Songs | The Splat | #TBT | Nickelodeon UK! Follow NickALive! on Twitter, Tumblr, Google+, via RSS, on Instagram, and/or Facebook for the latest April Fools Day on Nickelodeon and The Splat News and Highlights! Sing along with Rusty, Ruby, the Bits, and Botasaur to the theme song for Nick Jr.'s brand-new show, Rusty Rivets! Build, create, and design with Rusty and the gang. Listen to the music kids will enjoy! Practice your Italiano with your friends from Rusty Rivets! Find more Rusty Rivets music videos and kids songs on nickjr.it! Yeah! They're on the way! PAW Patrol, we're on a roll! Buckle up and sing along to the Blaze and the Monster Machines official theme song! This theme song will have you and your preschooler revved up for more monster machines. Kids can find this song and more when they watch Blaze and the Monster Machines on Nickelodeon and in the Nick Jr. app. Practice your Italian with your friends from Blaze and the Monster Machines! Let's Blaze! 1, 2, 3, Let's Blaze! Molly: I'm Molly! Gil: I'm Gil! Goby: I'm Goby! Deema: I'm Deema! Oona: I'm Oona! Nonny: I'm Nonny! Bubble Puppy: Arf, arf! Molly and Gil: Bubble Puppy! All: Bubble Guppies! (clap clap) Bubble Guppies! Learn how to draw this blazing monster machine, our very own Blaze from Blaze and the Monster Machines! Try your hand at drawing this fun character and don’t forget to watch Blaze and the Monster Machines on Nick Jr. Practice your Italian with the machines from Blaze and the Monster Machines! Learn how to draw the triceratops monster machine Zeg from Blaze and the Monster Machines! Try your hand at drawing this fun character and don’t forget to watch Blaze and the Monster Machines on Nick Jr. Practice your Italian with the machines from Blaze and the Monster Machines! More Nick: Blaze and the Monster Machines; PAW Patrol; Rusty Rivets; Shimmer and Shine | Theme Songs in Castilian Spanish | Nick Jr. España! Follow NickALive! on Twitter, Tumblr, Google+, via RSS, on Instagram, and/or Facebook for the latest Nickelodeon Italy and Nick Jr. Italia News and Highlights! Check out these epic pranks from iCarly and Drake & Josh! More Nick: LOL w/ the Teleprompter April Fools Prank w/ Jace Norman, JoJo Siwa & More | Nickelodeon! Follow NickALive! on Twitter, Tumblr, Google+, via RSS, on Instagram, and/or Facebook for the latest April Fools Day on Nickelodeon and TeenNick News and Highlights! Follow NickALive! on Twitter, Tumblr, Google+, via RSS, on Instagram, and/or Facebook for the latest April Fools on Nickelodeon and SpongeBob SquarePants News and Highlights! Find your perfect job at Viacom International Media Networks (VIMN) UK at careers.vimn.com! Visit viacomtalent.blog for more insights from Viacom International Media Networks (VIMN) UK! Follow NickALive! on Twitter, Tumblr, Google+, via RSS, on Instagram, and/or Facebook for the latest Nickelodeon UK and Viacom International Media Networks (VIMN) News and Highlights! Follow Margaret's organization, Women in Animation, on Twitter and Instagram, and keep up with the Nick Animation Podcast's intrepid host Hector on his own Twitter and Instagram pages! Stay tuned to the Nickelodeon Animation Podcast next week for their interview with veteran producer of Rugrats, Recess and more - Paul Germain! More Nick: Benji & Fede @ Los Angeles | Ep. 6: Colazione con Spongebob | Nickelodeon Italia! More Nick: Your Favourite Nick Stars Are Taking Over Nickelodeon UK This Easter In The "The All Star Takeover"! Additional source: The Thundermans Wiki. Follow NickALive! on Twitter, Tumblr, Google+, via RSS, on Instagram, and/or Facebook for all the latest Nickelodeon UK and The Thundermans News and Highlights! La saison 2 de Rock Academy sera diffusée à partir du lundi 10 avril à 18h30 ! Retrouve plein de vidéos de Rock Academy sur NICKELODEON.fr ! Plus Nick: Nickelodeon France To Premiere New "SpongeBob SquarePants" Episodes From Saturday 1st April 2017! Follow NickALive! on Twitter, Tumblr, Google+, via RSS, on Instagram, and/or Facebook for the latest Nickelodeon France and School of Rock News and Highlights! Leading kids and family entertainment brand Nickelodeon is bringing in a bumper crop of over 600 original and acquired episodes of new and returning series to Asia in 2017! The network has increased its content pipeline year-on-year across preschool, animation, live-action and TV movie/specials genres. During the 2017-2018 programming season, viewers can catch at least seven new shows and TV movies such as the Nickelodeon original animated series Bunsen is a Beast and Pinky Malinky, and the Nickelodeon Original Movie Legends of the Hidden Temple. Four new preschool series are slated to premiere in the year and these include Rusty Rivets, which debuted across Asia earlier this month on Nickelodeon and Nick Jr., and Nella the Princess Knight. From February 2017 through March 2018, the network will debut an international, year-long “SpongeBob Gold” campaign. Fans can expect new SpongeBob SquarePants episodes, videos, games, and themed on-air packaging, logo, and look for Nickelodeon websites along with activities rolled out all year long. The “SpongeBob Gold” campaign kicked off with the first initiative “The Golden Krabby Patty Spectacular” where fans could visit www.nick-asia.com/krabbypatty for Krabby Patty themed games, videos, and the chance to win prizes. They were also invited to tune into the channel on 24 February to catch three hours of the wackiest Krabby Patty-themed episodes which also included the premiere of the brand new SpongeBob SquarePants episode "Goodbye, Krabby Patty? ", guest starring Jon Hamm (Mad Men) as the charismatic, sharp-witted and devastatingly charming advertising agency executive Don Grouper. Nickelodeon’s hottest preschool property PAW Patrol has been on a roll with the show being picked up for a fourth season. It is hitting the road with its first-ever live stage show PAW Patrol Live! : Race to the Rescue and in Asia, the show heads first to the Philippines in June. Last year, a number of on the ground PAW Patrol events and appearances were held in Indonesia, Malaysia, Philippines and Singapore, and the PAW Patrol Pups Take Flight app based on the series was released. Other preschool programmes that have been renewed include Blaze and the Monster Machines for season four and Shimmer and Shine for season three. Live-action series that have been renewed include Henry Danger for season four, Game Shakers for season three, and The Thundermans for season four. The second season of animated series The Loud House will premiere on Nickelodeon Asia this year. - The Day Henry Met is a new animated series about Henry, a four-year-old boy who always wants to learn and find out more. - Additionally, Nick Jr. will air new episodes of Max & Ruby, Wallykazam! and Zack & Quack. Additional Nick Jr. content such as videos, games, and fun activities can be accessed from the newly launched nickjr.tv website. - Nickelodeon will premiere new seasons of SpongeBob SquarePants (season 10), The Loud House (season two), Teenage Mutant Ninja Turtles (season five) along with a slate of new animated series in Asia. - Bunsen is a Beast is an original animated comedy which follows the adventures of Bunsen, the first beast to attend a human grade school, and his best friend and classmate Mikey, who guides Bunsen through the ups and downs of life as a human. The series will premiere on the Nickelodeon channel and Nickelodeon Play app. - Mysticons is a half-hour action series about four girls who transform into legendary warriors and band together to save their realm from an evil queen, Necrafa. - Pinky Malinky is a mockumentary series following the everyday life of Pinky Malinky, an infectiously positive hot dog living in a human world. Teenage Mutant Ninja Turtles follows four mutant turtles trained in the art of ninjutsu by their mutant rat sensei, Master Splinter, who teaches the turtles to battle evil from the New York City sewers. To premiere on the Nickelodeon Play app and Nickelodeon channel. - Nickelodeon will also air new episodes of returning animated series Tales of the Teenage Mutant Ninja Turtles (TMNT season five; to air on the Nickelodeon Play app and Nickelodeon channel), ALVINNN!!! and The Chipmunks, Harvey Beaks, Pig Goat Banana Cricket, Rabbids: Invasion, Regal Academy, and The Fairly OddParents. - Joining Nickelodeon’s live-action lineup are the following new series: Hunter Street is an adventure comedy series. When Mr and Mrs Hunter go missing, it’s up to their foster children to unravel the mystery while keeping up appearances that everything’s fine. Rank the Prank is a unique prank show that empowers everyday kids by teaming them up with the world’s top special effects teams to stage the most incredible and entertaining pranks ever seen on TV! The show is now available on the Nickelodeon Play app and is currently airing on Nickelodeon Philippines. - Nickelodeon will also air new episodes of returning live-action series Game Shakers (season two), Henry Danger (season three), Nicky, Ricky, Dicky & Dawn (season two), School of Rock (season two), and The Thundermans (season four). Nickelodeon’s marquee TV events, movies and specials will return this year. Also, joining Nickelodeon’s lineup are the following new TV movies, Legends of the Hidden Temple is a new action-adventure movie drawing from the iconic game show’s premise of kids competing to retrieve artefacts from a mysterious Mayan temple. Rufus 2 is the sequel you’ve been itching for – Rufus is back as the Dog who became a dude. Starring Jace Norman (Henry Danger) as Rufus, Davis Cleveland (Legendary Dudas) and Manny, Haley Tju (Bella and the Bulldogs) as Paige, and Jade Pettyjohn (School of Rock) as Kat. More Nick: Top-Rated Nickelodeon Charts Path Beyond TV, Details Content Pipeline Of Almost 700 New Episodes In Every Genre! Original source: Television Asia Plus. Follow NickALive! on Twitter, Tumblr, Google+, via RSS, on Instagram, and/or Facebook for the latest Nickelodeon Asia News and Highlights! To celebrate Nickelodeon UK and Ireland/HD starting to premiere and show Nickelodeon's brand-new live-action comedy adventure series Hunter Street weekdays at 5:30pm from Monday 24th April 2017, Nick.co.uk has unveiled Nick UK & Eire's all-new official Hunter Street show website, nick.co.uk/hunterstreet! Nickelodeon enters the world of mystery and adventure in the brand-new series Hunter Street! The new 20-episode series follows the journey of five foster kids on a quest to find their missing parents, Erik (Ronald Top) and Kate Hunter (Tooske Ragas), after they mysteriously disappear. After spending his first night in his new home, Max, along with new siblings Tess, Anika, Sal and Daniel wake up to find their foster parents, Erik and Kate have vanished. In order to crack the case, the Hunter siblings set out on the challenge of a lifetime whilst searching for clues, leading them on an epic and suspenseful family adventure, including boat racing through canals, exploring secret tunnels and uncovering lost treasures. To uncover the truth they will have to dig up secrets in their old Amsterdam canal home. With obstacles at every turn, they must also fight off old family rivals and duplicitous heirs in order to solve the mystery - all while running the family home! Watch the mystery unfold as the siblings piece together evidence and discover shocking stuff they never knew about their parents! The mystery begins Monday 24th April 2017 at 5:30pm on Nick UK & Eire/HD! Following the debut of each brand-new episode, Nickelodeon UK and Ireland will encore each episode the same night at 8:00pm, and the following weekday morning at 8:00am. 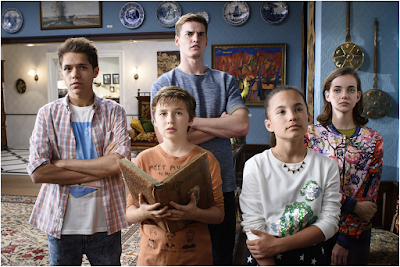 Hunter Street stars Stony Blyden as street-smart Max; MaeMae Renfrow as the independent and resourceful sister Tess; Kyra Smith as the free-spirited youngest Hunter sister Anika; Daan Creyghton as Sal, the genius of the bunch; and Thomas Jansen as the fiercely protective eldest brother Daniel. On Nickelodeon UK's brand-new Hunter Street series webpage, fans can find out more about Nick's all-new comedy adventure series, meet the characters in the show, watch Nick's extended Hunter Street launch trailer, flip through Nick's animated GIF gallery, and take part in Nick's fan poll: Which Hunter sibling are you most like? Hunter Street is produced by Blooming Media. 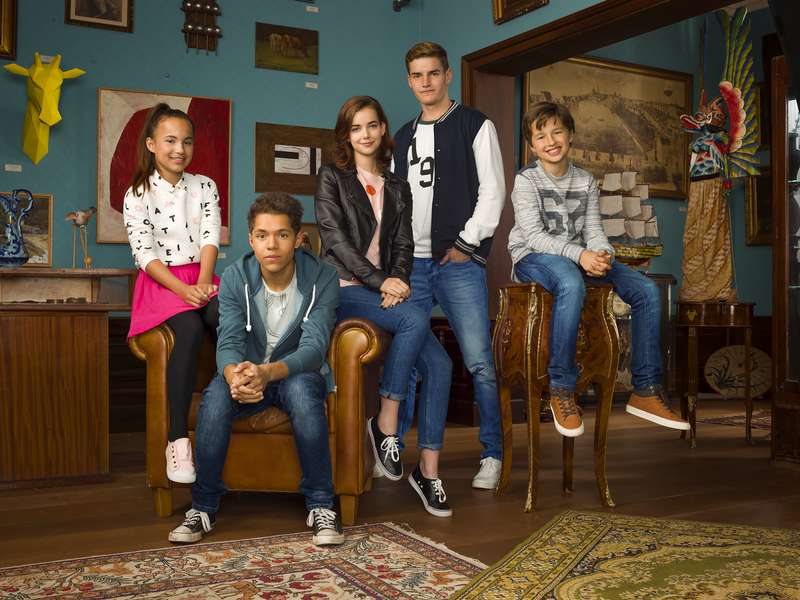 Hunter Street was co-developed with the Nickelodeon Netherlands series, De Ludwigs and will air on Nickelodeon international channels this spring. Fans can follow @HunterStreetTV on Facebook and Instagram to learn more about the series and its characters. Follow NickALive! on Twitter, Tumblr, Google+, via RSS, on Instagram, and/or Facebook for the latest Nickelodeon UK and Hunter Street News and Highlights! London, Thursday 30th March – Nickelodeon & Viacom Consumer Products (NVCP) held their annual UK Achievement Awards today at London’s Ham Yard Hotel. Recognising the accomplishments of UK retail and license partners across the year, eight awards were presented by Marianne James, VP Commercial Partnerships, Consumer Products and Experiences, Nickelodeon UK & Ireland along with Mark Kingston, GM & SVP EMEA & International Promotions & Consumer Packaged Goods Viacom International Media Networks. The pair were joined on stage by Chase and Marshall from the hit Nick Jr. property, PAW Patrol. Asda won for Retail Campaign of the Year for the PAW Patrol Summer campaign. 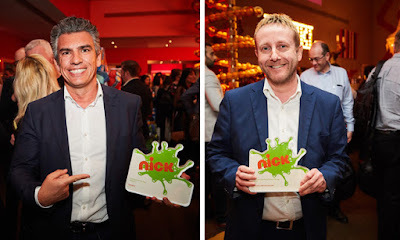 The Entertainer were named Retail Partnership of the Year in recognition of the support shown to the Nickelodeon and Nick Jr. brands with their range of Science Kits and Dough Lines, now available internationally. Blues Clothing took the award for Softlines Partnership with Egmont Publishing named Content Partner of the Year. MV (outdoor) won for Innovative Hard Line Product or Range with their Chase Cruiser receiving a special mention from the NVCP team. Dr. Martens were lauded for the Teenage Mutant Ninja Turtles range winning Collaboration of the Year while Sambro were named Licensee of the Year with their efforts in pursuing business opportunities and developing diverse and innovative product lines praised. Danilo’s relationship with NVCP was recognised with the greetings cards, gift wrap, calendar and diary company receiving the award for Long-Standing Partnership. The home of SpongeBob SquarePants, Teenage Mutant Ninja Turtles, PAW Patrol and Dora the Explorer, Nickelodeon UK & Ireland Network is available in over 13 million cable and satellite homes and now reaches more than 10 million viewers a month. Launched in 1993, the top-performing Nickelodeon network comprises seven dedicated entertainment channels for kids aged 4-15 and their families: Nickelodeon, Nickelodeon HD, Nickelodeon +1, Nicktoons, Nick Jr., Nick Jr. +1 and Nick Jr. Too. The entertainment company has built a diverse multi-platform business by putting kids first in everything it does – Kids Rule! Content is at the core of the business with critically-acclaimed and hugely-popular television programming from the UK and around the world. In addition to the quality television programmes, Nickelodeon also produces bespoke content available online and on Nick Play, as well as consumer product and recreation opportunities such as the UK’s first-ever Nick theme park, Nickelodeon Land and the Nickelodeon Store in Leicester Square. Photos via Licensing Source and Toys 'n' Playthings. Follow NickALive! on Twitter, Tumblr, Google+, via RSS, on Instagram, and/or Facebook for the latest Nickelodeon & Viacom Consumer Products UK News and Highlights! Celebrate Women's History all month with Nickelodeon at nick.com/thanks! More Nick: Celebrating Women’s History Month | Here's to All the Girls Who Are Changing the World | Nickelodeon! Follow NickALive! on Twitter, Tumblr, Google+, via RSS, on Instagram, and/or Facebook for the latest Women's History Month on Nickelodeon News and Highlights! More Power Rangers: Minecraft Releases Power Rangers Skin Pack! She's Nella the Princess Knight! More Nick: Rusty Rivets; Blaze And The Monster Machines; Shimmer And Shine | Português Theme Tunes | Nick Jr. Brasil! Additional source: Anime, Mangá e TV. Follow NickALive! on Twitter, Tumblr, Google+, via RSS, on Instagram, and/or Facebook for the latest Nickelodeon Preschool, Nick Jr. Brazil and Nella the Princess Knight News and Highlights! Here's a knightly musical quest for you and your family -- see who can sing the Nella the Princess Knight (Nella: Mas Que una Princesa) theme song the best! Help your child learn the lyrics, and then start singing and dancing your princess-knight hearts out to this karaoke music video. Practice your Latin American Spanish with your friends from Nella the Princess Knight! Find our collection of Nick Jr. kids songs and even more Nella the Princess Knight videos on the official Nick Jr. Latinoamérica site! More Nick: Nick Jr. Latin America To Premiere "Nella The Princess Knight" On Monday 3rd April 2017! Follow NickALive! on Twitter, Tumblr, Google+, via RSS, on Instagram, and/or Facebook for the latest Nickelodeon Preschool, Nick Jr. Latin America and Nella the Princess Knight News and Highlights! Clip from Ren & Stimpy episode "Jiminy Lummox". More Nick: Nickelodeon And Paramount Announce "The Loud House" Movie! Y recuerda que Heidi está en Nick de lunes a viernes 7PM MX/COL - 8PM ARG/VEN. More Nick: Mondo TV And Alianzas Producciones Greenlight "Heidi" For Two New Seasons; Names Agents! Follow NickALive! on Twitter, Tumblr, Google+, via RSS, on Instagram, and/or Facebook for the latest Nickelodeon Latin America and Heidi Bienvenida a Casa News and Highlights! Clip from The Thundermans Halloween special "Happy Heroween". More Nick: Nickelodeon Italy To Premiere "Rank The Prank" On Saturday 1st April 2017! Follow NickALive! on Twitter, Tumblr, Google+, via RSS, on Instagram, and/or Facebook for all the latest Nickelodeon Italy and The Thundermans News and Highlights! Catch more Teenage Mutant Ninja Turtles on Nickelodeon and Nicktoons! More Nick: Nickelodeon Reimagines The Iconic "Teenage Mutant Ninja Turtles" In All-New 2D Animated Series, "Rise Of The Teenage Mutant Ninja Turtles"! Follow NickALive! on Twitter, Tumblr, Google+, via RSS, on Instagram, and/or Facebook for the latest Nickelodeon UK, NickToons UK and Teenage Mutant Ninja Turtles News and Highlights! Plus Nickelodeon: Nickelodeon France To Premiere "The Thundermans" Special "Thundermans: Secret Revealed" On Friday 31st March 2017! Follow NickALive! on Twitter, Tumblr, Google+, via RSS, on Instagram, and/or Facebook for the latest Nickelodeon France News and Highlights! Mehr Nick: Hey Nickelodeon Online Spezial: Laura bei „Rock4Kids" | Nickelodeon Deutschland! 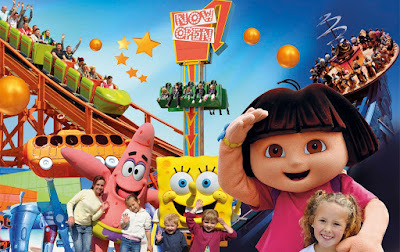 Plus d'infos sur le site : www.nickelodeontour.fr! Mehr Nick: Victorious in den 1920ern | Nicknight | Nickelodeon Deutschland! Follow NickALive! on Twitter, Tumblr, Google+, via RSS, on Instagram, and/or Facebook for the latest April Fools Day on Nickelodeon Germany, Nicknight and Big Time Rush News and Highlights! las mejores genios que hay. Buckle up and sing along to the Blaze and the Monster Machines official theme song! This theme song will have you and your preschooler revved up for more monster machines. Kids can find this song and more when they watch Blaze and the Monster Machines on Nickelodeon and in the Nick Jr. app. Practice your Spanish with your friends from Blaze and the Monster Machines! Let's Blaze! ¡Cantad con Rusty, Ruby, Los Bits y Botasaurio la cabecera de la nueva serie de Nick Jr., Rusty Rivets! Construye, crea y diseña con Rusty y sus amigos. ¡Escucha la música que te divertirá! ¡Practica [Español] con tus amigos de Rusty Rivets! More Nick: Nickelodeon Spain Announces "Nickelodeon Tour 2017"! Follow NickALive! on Twitter, Tumblr, Google+, via RSS, on Instagram, and/or Facebook for the latest Nickelodeon Spain and Nick Jr. España News and Highlights! Sing along with Rusty, Ruby, the Bits, and Botasaur to the theme song for Nick Jr.'s brand-new show, Rusty Rivets! Build, create, and design with Rusty and the gang. Listen to the music kids will enjoy! Practice your Polski with your friends from Rusty Rivets! Buckle up and sing along to the Blaze and the Monster Machines official theme song! This theme song will have you and your preschooler revved up for more monster machines. Kids can find this song and more when they watch Blaze and the Monster Machines on Nickelodeon and in the Nick Jr. app. Practice your Polish with your friends from Blaze and the Monster Machines! Let's Blaze! More Nick: Blaze and the Monster Machines; PAW Patrol; Rusty Rivets; Shimmer and Shine | Theme Songs in Dutch | Nick Jr. Nederland! Follow NickALive! on Twitter, Tumblr, Google+, via RSS, on Instagram, and/or Facebook for the latest Nickelodeon Poland and Nick Jr. Polska News and Highlights! 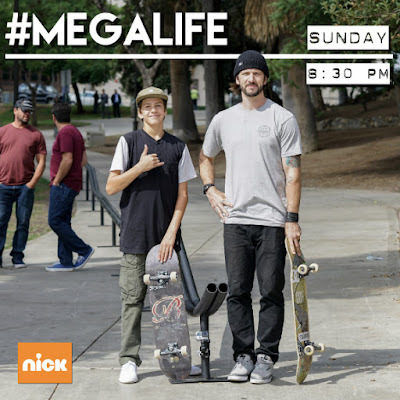 Jagger Eaton and Chris Cole Smash two skateboarding records on "Jagger Eaton’s Mega Life"
For last weekend’s episode of Nickelodeon's action-packed docu-series Jagger Eaton's Mega Life, Jagger Eaton, a 16-year-old X Games competitor and the star of the show, took on a pair of Guinness World Records titles. Enlisting the help of pro-skateboarder Chris Cole, the duo teamed up to tackle the records for Longest 50 - 50 rail grind on a skateboard and Most fakie kickflips on a skateboard in one minute. For those unfamiliar with skateboard terminology, a 50-50 rail grind refers to the centre of the board gliding along a railing - a skill that requires a mastery of force and balance. Likewise, to achieve a successful fakie kickflip, the rider must use his or her centre of gravity to ollie the skateboard; then spin it 360 degrees with the front foot while riding in a fakie stance. The pressure was on for both participants, especially Mega Ramp competitor Jagger, who attempted the rail grind record; a title held by idol and professional skateboarder Rob Dyrdek. On set of the show in Los Angeles, California, official adjudicator Michael Furnari was present to verify that all guidelines were followed. Chris went first, knowing he needed to achieve over 14 fakie kickflips in order to beat the previous record holder. With a few jerks of the feet, Cole was flipping consistently for the duration of 60 seconds. On his very first try, the boarder showed off his level of talent with a new record of 24 fakie kickflips. Up next, Jagger stepped up to challenge the record of his favourite skateboarding professional. The teen then took one powerful leap and glided smoothly down the railing – achieving a final distance of 204 ft (62.1792 m), doubling the previous record. After celebrating with their certificates, Jagger continued the episode by attempting a series of fun titles with his younger brothers. Although none of the attempts were successful, Jagger and his brothers had a blast trying their hand at unique records, and a taste of how much practice is needed to hold a world record title! With a job well done, Jagger, who made history back in 2012 when became the world’s Youngest X games athlete at the age of 11 and 129 day, can now add another record title to his growing collection. Jagger Eaton’s Mega Life premieres every Sunday on Nickelodeon USA and follows the adventures of the teen skateboarder as he introduces viewers to people who are pushing boundaries, living their lives to the fullest, and inspiring others to follow their lead. To watch the record-breaking episode, click here. Backstage is reporting the very exciting news that Nickelodeon are currently casting talent for a pilot for a potential brand-new TV series! Nickelodeon and Miami Talent Casting are seeking young male and female actors aged 7–26 of all ethnicities, who can pass for high school students, as extras and for background roles in the pilot. Production on the pilot will commence on Monday 17th April 2017 in Miami, Florida. Those hired will be paid $85–$200/day. For full information and to apply, visit Backstage.com! A US $175-million tourist development, including a Nickelodeon-branded attraction, for the resort town of Huatulco, Oaxaca, was announced yesterday during the 42nd Acapulco Tianguis Turístico, Mexico’s biggest travel trade show, Mexico News Daily reports. 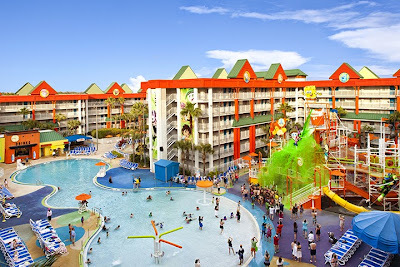 Lagoon Pool at Nickelodeon Suites Resort in Orlando, Florida. 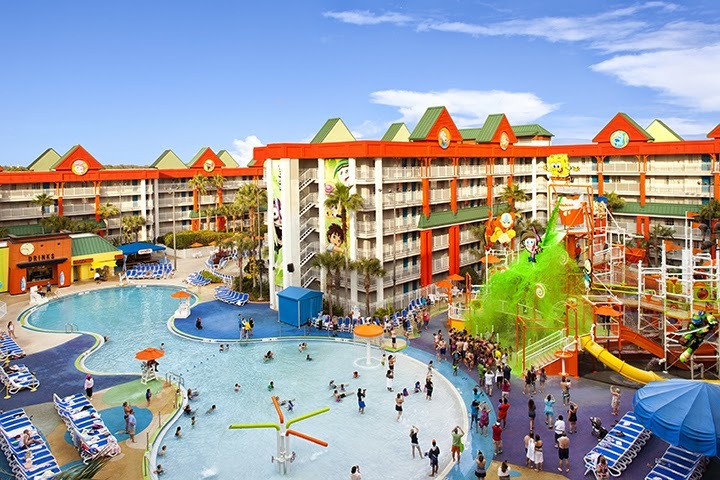 The mega-project will include a US$15 million Nickelodeon resort and water park with 761 hotel rooms, five large pools and 13 restaurants with seating for 2,500 in Huatulco’s Bahía de Conejos. The news was announced by Oaxaca Governor Alejandro Murat Hinojosa and representatives of the Mexican firm Grupo Lomas, who also referred to plans to improve air connectivity to the resort destination with new flights by its regional airline, MAYAir. The company announced plans for Huatulco early last year after purchasing its Bahía de Conejos property, located near Secrets Resort & Spa. At that time it also said it planned to build a marina. Murat said his administration will boost tourism as never before, pointing out that the industry is the state’s principal productive activity and represents the main source of income for close to 100 communities. “We want to invite all of Mexico to come and get to know this special world that is Oaxaca,” said the governor, highlighting features such as its 550 kilometers of coastline and the greatest biodiversity in Mexico. Murat also pointed out that Oaxaca is part of the Mayan route, a flagship project of the federal government during this year’s Tianguis that promotes the Mayan World route of the airline Aeromar, linking destinations in Campeche, Chiapas, Quintana Roo, Tabasco, Yucatán and Oaxaca. This Easter, join your favourite Nick Jr. All-Stars as they take over intu's Kids’ Club for the holidays! Nickelodeon UK and Ireland have partnered with intu to launch a series of The Nick Jr. All-Star Easter Takeover experiences at popular shopping destinations throughout the Easter holidays to keep families entertained for free. Children can immerse themselves in a whole range of free fun activities, including perfecting ninja moves with the Half Shell Heroes, building their own Blaze and the Monster Machines, or making their wishes come true with a photo on Shimmer and Shine’s magical flying carpet. Plus, there'll be be chances for kids to meet and greet PAW Patrol heroes Chase and Marshall! 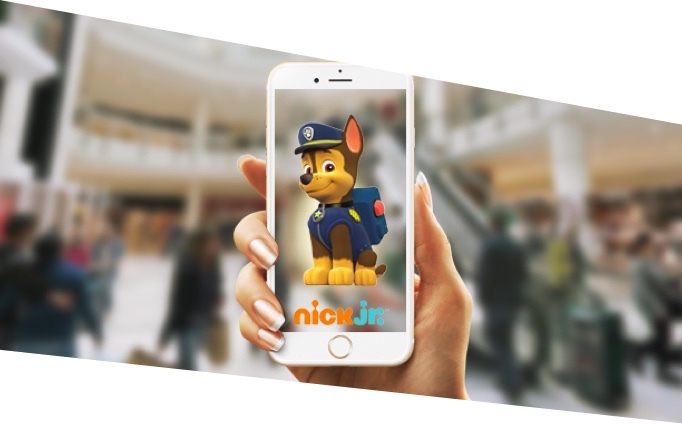 Families will also be able to hunt for even more Nick Jr. characters and experiences by using their smart devices to scan images they find within the centre, thanks to a free augmented reality game available through the intu app. And guests will be able to take home pictures of themselves with a number of Nick Jr. characters thanks to the magic of green screen technology! “Parents shouldn’t miss out on the opportunity to put a smile on the faces of every Nick Jr. fan in their family by giving them the chance to take part in free activities and games starring their favourite characters. Step inside intu's Shimmer and Shine Beauty Parlour and be transformed into a mini magical genie! There’ll be hair braiding, glitter tattoos and you can make your very own ‘Shimmer & Shine’ friendship bracelet for your bestie – or keep it for yourself! Join intu's Sensei at the Half Shell Heroes Ninja Academy where you’ll learn some awesome ninja moves – one key move from each of the four half shell heroes. Helmets on, pick a monster truck and come join the Blaze and the Monster Truck Driving School and test yourself as you avoid the cones! Then get super creative and make your very own monster truck driving license with instant photo printing and personalised number plate. Grab some props and pose in front of intu's fun and interactive green screen where you can choose from a number of Nick Jr. All-Star backgrounds! Do you want to meet Chase or Marshall? The pups have made a special trip from Adventure Bay to see you; so don’t miss them at intu's Kids’ Club this Easter! Choose your favourite Paw Patrol star and intu's face paint artists will work their magic transforming the little ones! Bring the Nick Jr. All-Star characters to life with intu's augmented reality game! Download the intu app and get ready to hunt the centre in search of your favourite characters. Find them all for your chance to win a Nick Jr. goody bag! Available on ios and Android. T&Cs apply. Download the app. Genie Jen will be teaching little Genies (and parents too!) all the magic genie moves from the show. Plus make your own Shimmer & Shine friendship bracelets. Using the colour’s of your favourite friends from Zahramay Falls, create your own magical genie bottle. Get your paws on some great toys, games and clothing! Keep the fun going at home with intu's awesome Nick Jr. All-Star colouring sheets! More Nick: Nick Jr. UK To Take Viewers Of Egg-Citing Easter Adventures This April! Source: Bdaily; Additional source: Google.co.uk. Follow NickALive! on Twitter, Tumblr, Google+, via RSS, on Instagram, and/or Facebook for the latest Easter on Nickelodeon Preschool and Nick Jr. UK News and Highlights! For its latest arcade redemption game, Andamiro USA Corp. is betting on another licensed property. PAW Patrol is based on Nickelodeon's number-one CG-animated adventure series of the same name. The game pools the play appeal of a single-button skill stop with the series' puppy characters and their human protagonist. "PAW Patrol combines the classic gameplay of an arcade spinner with a great package that was designed with Nickelodeon artists," Drew Maniscalco, Andamiro USA marketing vice-president, told Vending Times Inc. "The cabinet will attract kids of all ages, and the easy-to-learn but challenging-to-master element will keep them coming back." Nickelodeon's PAW Patrol CG-animated series stars a pack of heroic rescue pups-Chase, Marshall, Rocky, Rubble, Zuma, Skye and the newest pup Everest-who are led by a tech-savvy boy named Ryder. Together they work hard to show the people of Adventure Bay that "no job is too big, no pup is too small!" Produced by Spin Master Entertainment, the series features a curriculum that focuses on citizenship, social skills and problem-solving. PAW Patrol is the number-one preschool series on Nickelodeon and airs weekdays at 12 p.m. (ET/PT). PAW Patrol is created by Keith Chapman (Bob the Builder). It is produced by Spin Master Entertainment with animation by the Canadian animation studio Guru Studio. The series premiered on Nickelodeon in the U.S. in August 2013, and airs on Nickelodeon and Nick Jr. channels globally. PAW Patrol is the third Andamiro game based on a animated Nickelodeon series. 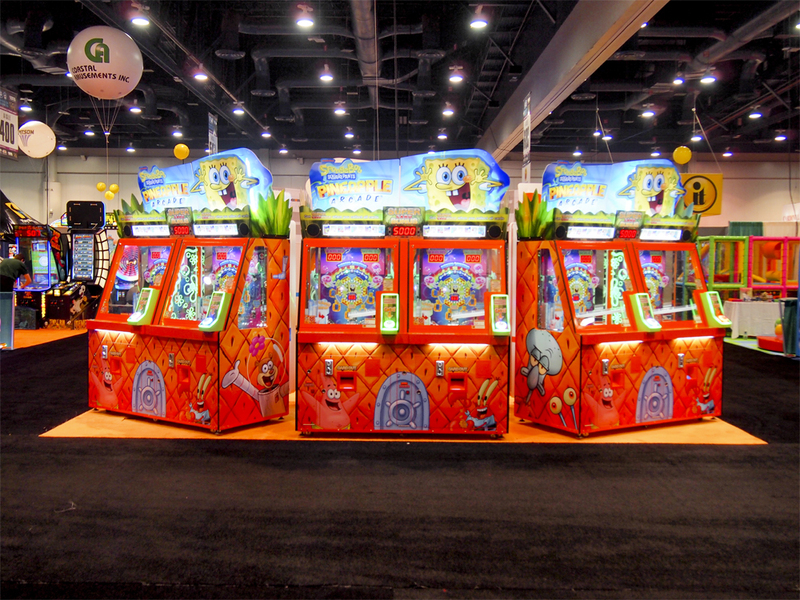 The previous games, SpongeBob's Pineapple Arcade and SpongeBob Order Up, each performed well in a range of gameroom environments, attracting a wide player demographic. 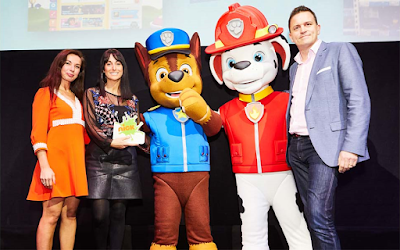 "PAW Patrol is one of Nickelodeon's more recently introduced properties, and one of its most popular," added Andamiro USA sales manager Ryan Cravens. "It's definitely going after a younger crowd -- the preschool and a little older demographic. It's incredibly popular now. 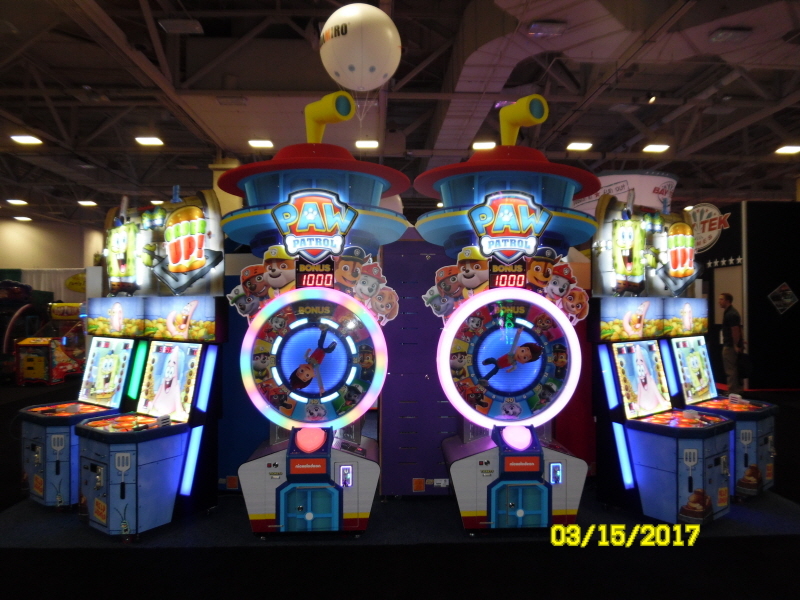 And this is the first product in the arcade industry that has licensed PAW Patrol for a game." Cravens explained that the design was prompted by requests for a game based on the cartoon from one of Andamiro's larger customers who recognized a market for it. More Nick: Durham Performing Arts Center, NC Adds Fifth PAW Patrol Live! "Race To The Rescue" Show! Follow NickALive! on Twitter, Tumblr, Google+, via RSS, on Instagram, and/or Facebook for the latest Nickelodeon Preschool and PAW Patrol News and Highlights! 10 year old JOSH PECK DOES STAND UP COMEDY!! Toys R Us UK Kicks Off "Wissper Week"